It can be a difficult experience for any non-English speaker entering a non-English situation with a group of non-English people. This is why it is essential to create a comfortable atmosphere that quickly encourages interaction, whether verbal or not. This is where a carefully thought out ice breaker game can be an extremely effective tool. The ice breaker game is often used in English Language lessons and works well to bring those who find the English language difficult together as a group. 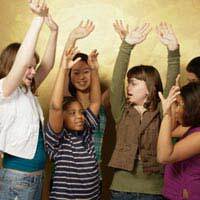 Many common ice breaker games can be used and it is not always necessary to incorporate a no speaking ice breaker game as many individuals in your group will have a certain amount of English language skills. The first thing to do when introducing a group of non-English speaking people is identify and clearly understand the different levels of English throughout the group. This will give you a good idea of how you can apply an ice breaker game and which to select. Identifying the level will also give you a great understanding of how the group will interact with one another. Depending on the standard of the groups English you can select some effective ice breaker games. If the group have a poor standard of English it is best to keep the ice breaker game as simple as possible. For example, most of the group may know how to say 'my name is...' and if they don't this can be taught extremely quickly. Just getting the group to say this sentence followed by their name will encourage interaction quickly while allowing the group to learn some basic English immediately. If the group have a more advanced standard of English you can delve into the vast selection of ice breaker games available. However, it is always safe to start off simple and it would be recommended to expand on the 'my name is...' game as this can be worked upon gradually while improvements and familiarities are set. Embrace the groups nationalities and encourage each individual to express themselves through their place of origin and native language. A good example of this is when you ask each individual to say a sentence about themselves in their native language followed by saying the same sentence in English. Be sure to help out if the individual gets stuck or requires a little encouragement.Sport ice breaker games or creative ice breaker games work especially well as language is not necessarily needed to allow these games to be effective. Although you want the individuals to learn the language ensure that everyone receives their required level of assistance as the groups levels are different so must your level of attention. You may need to encourage and focus on the individuals who's standard of English is not as high as others but be sure to include the whole group. Balancing the group is a tricky task but using simple ice breaker games such as the name game or a interaction techniques such as the 'point and say' game where you ask the group to point at an object, person or place and say what they're pointing at. This usually brings a lot of laughter amongst the group and encourages interaction.